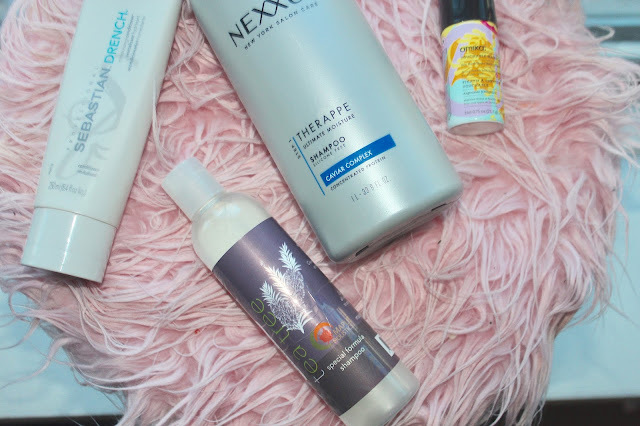 Unlike makeup products where I tend to know whether I like something or not almost immediately, I tend to test hair products for a few months before deeming something a hair hero. I am now just about through this bottle of tea tree special formula shampoo sent kindly from Maple Holistics and have discovered several other great hair helpers in the last year or so today it's about time I discuss. I am pretty picky with those hair products because I have very dry thick and knotty natural hair and also because I use those same products on my wigs I wash and want to keep them in good condition. I'm excited to give you a run down of some of my favorite hair products of the moment that are just working wonders for these strands! So here's the deal with my own natural hair. It's always been naturally thick and overly knotty but I also deal with a great amount of hair loss due to my hypothyroidism which only causes more knots. My ends are normally quite dry but my roots tend to get a little more build up and shine because I choose to only wash my hair 2-3 times a week. This is the reason I've always stuck to two shampoos and a good conditioner. I like a simple purifying clarifying solution to remove buildup, grease etc. from my roots and a hydrating option to treat my dry ends. Maple Holistics Tea Tree Special Formula Shampoo- This is what I've been using to clarify and purify and just get deep into my roots for a good scrub. It's a gentle formula with little to no lather but it does a really good job of giving my hair that squeaky clean feel. It's scent is basic and organic, slightly lemony maybe, nothing special but not offensive either. I like that it has tea tree oil in it which has many great scalp and hair growth benefits to offer and with it's short ingredient list mainly consisting of good for you hair oils like jojoba and argan, it's no surprise. What should I try from the company next? Their green powder superfood protein looks awesome. hmmm. Nexxus Therappe Ultimate Moisture Shampoo- This is my hydrating hair choice. It treats my ends and keeps them soft and healthy feeling for a few days at a time. I use this one from the ears down mainly to keep from over hydrating the crown and roots of my head which normally cause grease production. I tend to buy a large pump bottle because I like this one so much. I especially love this one where my wig is concerned as well because it keeps those ends soft and smooth too. Sebastian Drench Moisturizing Conditioner- All conditioners achieve the same result for me in most cases but this one has just been better then the rest where that hydration is concerned. It works immediately and the hydration and silkiness lasts for days. Normally I have a hard time brushing my hair and dread it because of that. This makes brushing through my hair a breeze. I use this from the ears down just as I do with the Nexxus shampoo. Amika Touchable Hairspray- I got this as a sample along with some of the other Amika products with my bonus points at sephora and I have to say I really like all of their products alot from the heat protecting oil to the dry shampoo. Amongst all of those though, this is one I am certain I can see myself purchasing in full size. It sits nicely on the hair and doesn't make it overly crisp feeling, but it also holds beautifully and smells incredible! What could be better then that in a hairspray? In my Irenes Wigs with some of my own natural hair pulled into the front. What are some of your favorite hair products of the moment?